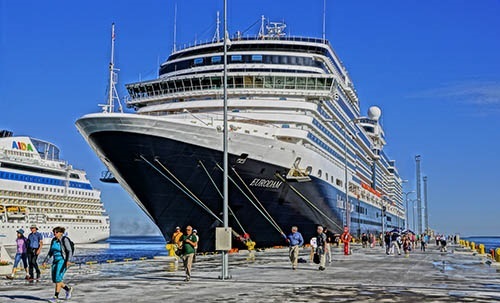 Eurodam passengers leaving ship for shore excursions in Tallinn. Of the seven ports on this Baltic cruise, I’ll give a brief report on the easternmost four here and save the German ports and Copenhagen for more extensive treatment later. I’ll also illustrate the four here with what I call my photo art interpretations. All of these provide a painterly look with in-camera special effects found on the latest Sony cameras. Our first port, Tallinn, is the port you are likely to know the least about. It is a small compact city of cobblestone streets and medieval architecture ideal for independent walking. Ships dock at terminals within walking range of city center. But the walk is up hill, so it’s best to catch a ride. The local Hop On-Hop Off bus costs $12 per passenger for 24 hours. A short stay here this day when the ship leaves at 3:30 is not worth it in my opinion. A logical alternative is a shuttle train for $6 one way to the central city square where there is a tourist info office. The walk back down hill to the ship is a leisurely stroll of 30 minutes or so. 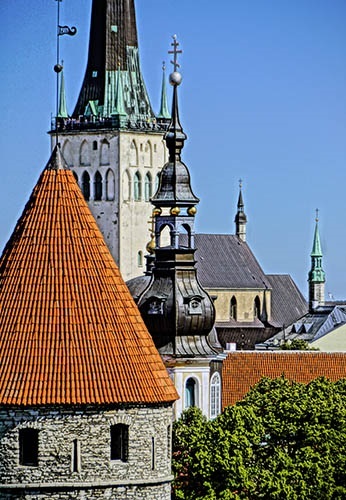 Upper Old Town is the best attraction here with great panoramas of the church steeples and rooftops from the upper town’s viewing platforms. Passing back down from these viewpoints, the Russian Orthodox Alexander Nevski Cathedral and the Toomkirik Dome Church from the 13th to 18th centuries will be encountered on the way to the 13th-century Toompea Palace, the seat of the Estonian Parliament, and the limestone walls and towers that belonged to its predecessor the medieval Toompea Castle. Side by side with Toompea lies the medieval Lower Town. Its landmarks include the 14th and 15th century Gothic Town Hall, the only one surviving in the Nordic countries, the Holy Ghost Church, the former St. Nicholas Church housing a museum of medieval art, the magnificent St. Olai’s with its soaring spire – once the world’s second tallest building – and an old chemists’ shop founded in 1422, as well as numerous Hanseatic merchant houses. A stop in Tallinn might also include the famous Cafe and Chocolaterie Pierre. Master Confectioner Pierre teaches how to make a variety of flavorful truffles with various ingredients. 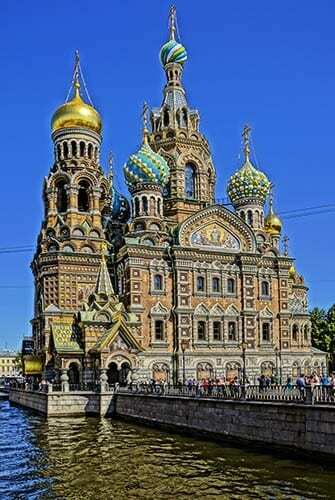 Russian Orthodox Church of the Savior on the Spilled Blood in St. Petersburg. 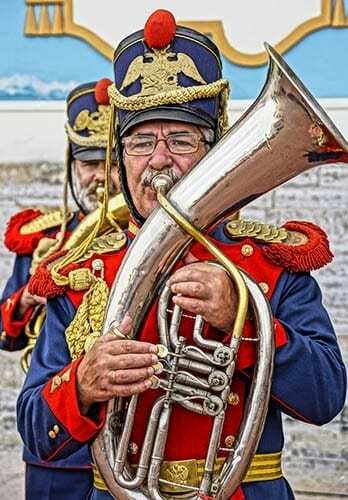 Walking tours in the city and cycling tours outside it are also popular first-timer excursions. At St. Petersburg the new ship terminal is far from the city and there is so much to see that it’s a good idea to sign up for a two day tour. The State Hermitage Museum, Catherine the Great’s Palace in Pushkin, the Peter and Paul Fortress enclosing the Baroque cathedral housing the tombs of the entire Romanov dynasty, the Church of the Savior on the Spilled Blood, a stroll down Nevsky Prospect and a visit to a station on one of the deepest subways in the world, and Peter the Great’s summer residence, Petrodvorets Palace (Peterhof), with its cascading fountains will likely all be included. Musician in Imperial military attire at Catherine the Great’s Palace in St. Petersburg. With an evening available in St. Petersburg, a ballet performance in the capital of ballet is an option to be seriously considered as well. Ballet arrived in Russia from Europe at the beginning of the 18th century during a period of cultural transition and was adapted wholeheartedly. Founded in the 1740s the ballet company was originally known as the Imperial Theatre School. During Soviet times it became the Kirov and then at the end of communist rule both the ballet and opera companies as well as the theater adopted the name Mariinsky. For those not going on a pre-arranged tour of Helsinki, a shuttle bus service from ship to near Market Square is available for ten euros per person for an all day pass. Boats in the harbor at Helsinki. The central city is compact and ideal for an independent walking tour, if you don’t mind traversing cobblestone streets while gawking up at classic Finnish architecture. The Museum of Contemporary Art and the Design Museum for contemporary style will attract art lovers, and history buffs should be sure to see the Lutheran Cathedral and onion domed Russian Orthodox Uspenski Cathedral. 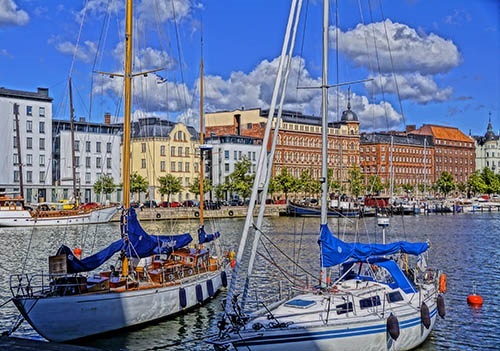 Surrounded on three sides by the Baltic Sea, Helsinki touring should include the water, if only to sip some drinks while harbor viewing at a waterfront café. 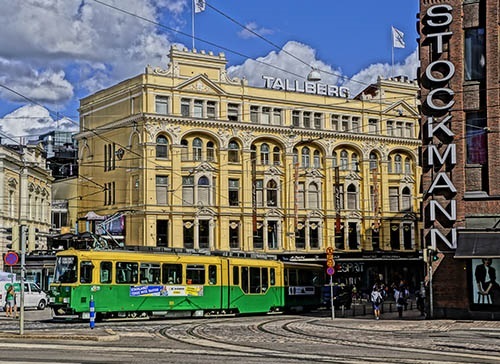 Your city tour might also take you further from Market Square and city center to Sibelius Park, Church in the Rock, Hietaranta beach, and various waterfronts and marinas for scenic views. Helsinki also offers a fabulous shopping destination for Finnish crafts, glassware, woolens and chocolates. Head for Stockman’s downtown department store for the center of all the shopping action. Finally, if there is time, a fifteen-minute ferry ride to Suomenlinna Sea Fortress for the historic buildings and museums set on interconnected islands is an option. There are two companies offering Hop On-Hop Off service in Stockholm. One is red and one is green. I have no idea why this is. Nevertheless, we signed up online in advance for both the green bus and boat ticket good for 72 hours to save money, even though we would only be in port for two days. The boat, which departed from a dock adjacent to the Eurodam, turned out to be by far the best way to get around and the best value. Winding in and out around the harbor was a scenic delight, especially for photography. 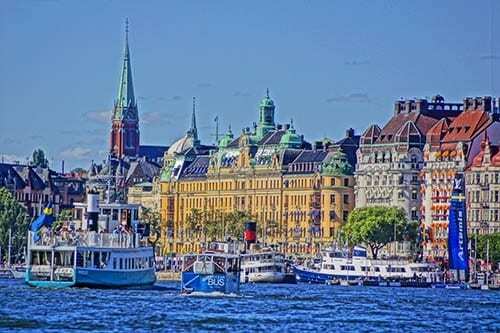 Sitting on fourteen islands, Stockholm is famous for its stunningly picturesque views that are best viewed from the water. From City Hall, where Noble prizes are awarded annually, to the Royal Palace, to the museums such as the Vasa, Hop On-Hop Off allows setting your pace with the convenience of a bus or boat coming along every twenty minutes at convenient stops. 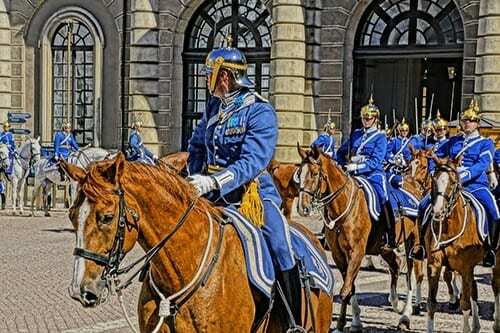 Changing of the guard ceremoney at Stockholm’s Royal Palace. Having been to Stockholm previously, I opted on the first day to visit a couple of the indoor historical museums as opposed to again seeing the best known outdoor museum of Sweden-in-miniature, Skansen. Part of my personal interest in Swedish life is that my paternal grandmother, whom I never knew, had immigrated to the U.S. from Sweden. So the Nordic Museum (Nordiska Museet) exhibition of clothing, fashion, textiles, furniture, jewelry, folk art, glass and china since the 16th century provided a great deal of insight into what her life would have been like. I even found the image of a woman on a porcelain vase that I imagine could have looked like her. 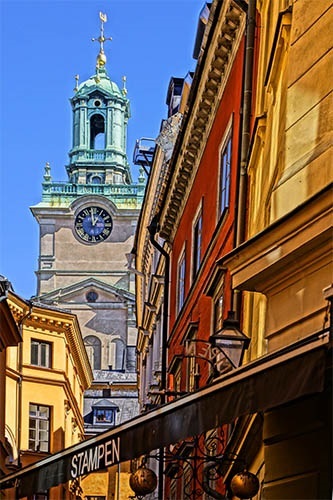 Stockholm’s colorful Gamla Stan (Old Town). Our second museum visit was to The Swedish History Museum (Historka Museet) that featured a large exhibition on the Vikings, including a playground for children to participate in games the Vikings played, and an extensive collection of the “barbaric metal” in a Gold Room. Gamla Stan, the Old Town where Stockholm originated, was where we spent our second day, particularly waiting for and witnessing the changing of the guard at the Royal Palace. Arriving nearly an hour early for the noon program assured us a position at the front of the crowd that was perfect for photography. The remainder of the afternoon was spent negotiating the narrow streets crowded with Saturday shoppers.